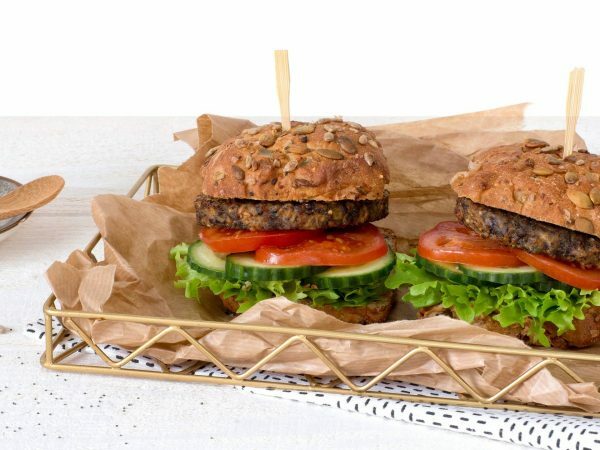 This vegetarian Seeds Burger fits perfectly into your healthy diet. Filled with a variety of seeds and grains, this delicious burger has a tasty, crunchy bite to it. The burger is based on wheat and pea protein and contains no soy. A Seeds Burger weighs 80 grams and is enriched with added iron and vitamin B12. Water, seeds 27% (pumpkin kernels, sunflower kernels, millet, flaxseed, poppy seed), vegetable protein 12% (wheat gluten, pea), vegetables (mushroom, garlic), egg protein*, starch (potato, wheat), sunflower oil, flavouring, dextrose, salt, wheat flour, herbs and spices, mineral (ferrous fumarate) vitamin B12. * Free-range eggs. Produced in a facility that processes peanuts and nuts.